The American Instrumental Ensemble Series, designed originally for Salvation Army brass ensembles, is an annual, “flex- scored” publication, offering complete versatility in regards to size of the ensemble, instrumentation, and part assignments. With four primary parts, an optional 5th part, two optional percussion parts and a keyboard part for further support, arrangements can be used by groups as small as a quartet or quintet or as large as a full orchestra. With “flex-scored” instrumentation, any combination of brass, woodwind, or string instruments can be used. Editorial suggestions for adding color for larger brass ensembles are included, but directors are encouraged to use their discretion to add variety and color to any ensemble. For example, an orchestra director may choose to use brass, string, and woodwind sections separately or in different combinations thereby adding texture and changing the tonal palette within a piece. With such versatility, a director can perform works multiple times with various groups but with a fresh, new, and exciting sound each time. While this music is primarily intended for worship and evangelistic services, it will also be appropriate for music festivals and educational use. Each arrangement includes a well-known hymn tune or gospel song melody that is clearly presented, allowing the import of the hymn and song texts to provide an unambiguous gospel message. 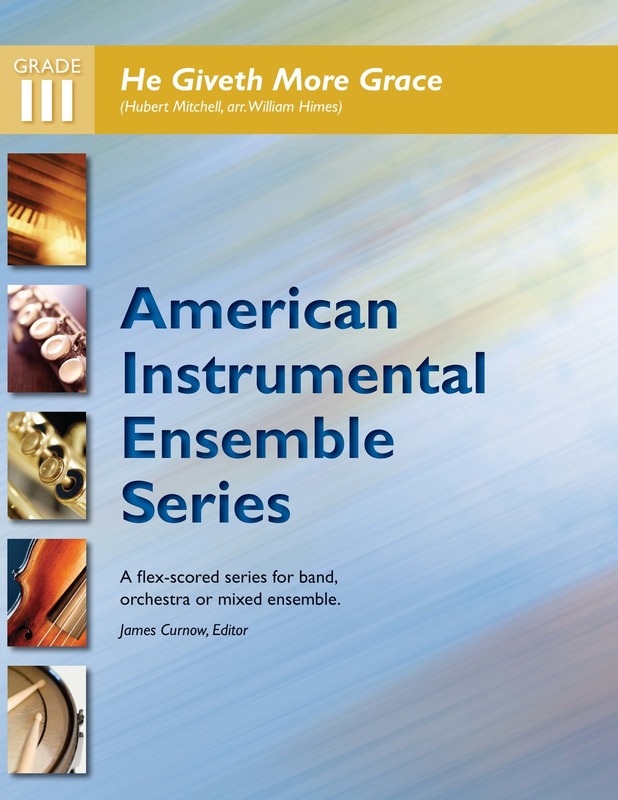 In print for over 30 years, the American Instrumental Ensemble Series is edited by Stephen Bulla and published annually with sixteen titles written at four specific grade levels, making this series popular with a wide range of instrumental groups. The clearly delineated grade levels make it simple to find appropriate music for groups ranging from developing students to the most advanced ensembles. It will be essential for the conductor to carefully assign the parts to ensure maintenance of balance within the ensemble. As soon as the basic quartet instrumentation in adequately covered, the optional Part 5 should be added. A special feature of the American Instrumental Ensemble Series is the addition of a keyboard, condensed score. This will be helpful to conductors for their score study and preparation and could be valuable when a part is missing in the ensemble during rehearsal or performance or to offer support to a smaller or less-experienced group. The optional Percussion 1 and 2 parts are not unimportant and their inclusion will greatly enhance these arrangements. The Bell parts could serve as a training device for pianists who are potential percussionists. Beginning in the 2010 edition, several parts have been added to maximize the flexibility of the series. These include an optional E-flat Soprano Part (for E-flat cornet or clarinet), Part 2 C (for violin, flute, or oboe), and Part 3 Viola. For music published prior to 2010, these parts will be supplied free of charge by contacting the Territorial Music and Creative Arts Department (music.department@uss.salvationarmy.org). A demonstration recording (cassette 1987-1994, and CD from 1995) is produced for each annual edition of the American Instrumental Ensemble Series. The demo recording will be useful to bandmasters and music directors in their repertoire planning and rehearsal preparation. With four carefully-designed levels of difficulty, music leaders will have a valuable tool for the selection of music best suited to the abilities of their ensembles. The compositional parameters for each grade level have been skillfully established so that each arrangement is not only well-crafted and aesthetically pleasing, but also educationally sound. Grade I is targeted at beginning ensembles and these very easy settings can be prepared for performance after just a few months of regular instruction. Rhythms have been kept extremely simple (whole, half and quarter notes) and 4/4, 3/4 & 2/4 are the acceptable time signatures. Articulation markings and dynamic changes are minimal. Keys are limited to Bb, Eb and Ab concert (i.e. C, F and Bb for Bb instruments, G, C and F for Eb instruments etc.). With the short endurance of beginners, the maximum length is 60 measures. The pitch ranges for Grade I have been limited primarily to an octave (please note AIES range limitations for each of the four grade levels on this page). Grade II provides easy arrangements for developing ensembles with contrasting styles and interesting concepts, but still with very few technical demands. Both Grade I and Grade II will be useful for more advanced groups as additional basic repertoire. Rhythms include eighth notes, but dotted eights are avoided. Ranges are extended and accidentals are more common (avoiding Fb’s and B#’s etc.). Articulation and dynamic markings remain basic. The maximum length is also 60 measures. Grade III arrangements are written at an intermediate level of difficulty and represent a considerable step up from Grade II. Sixteenth, triplet and dotted rhythms are added with a corresponding increase in overall rhythmic complexity. There is a significant expansion of range, an extension of maximum length, and the full gamut of articulation markings and dynamics are employed.